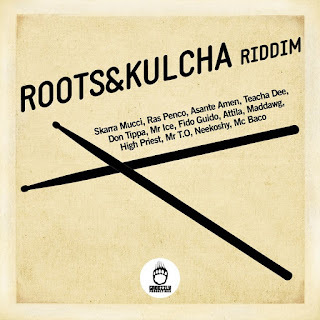 One month after the release of High Priest album Greezzly productions is back on the market with a 13 track heavyweights rub a dub riddim selection by the name of Roots & Kulcha featuring a line up of great quality artists from all over the world. Selection opens with Asante Amen's title track, a timeless reggae anthem by the highly talented jamaican singer, and it goes on with Ras Penco, artist known for international hits like "Thousand Miles Away", sharing the joy for his first child on the way. Europe based reggae superstar Skarra Mucci graced the riddim with a deep conscious tune as did his fellow Teacha Dee, currently working on his awaited solo album. Different topics for Don Tippa powerfull Rub a Dub anthem and Mr Ice sweet lovers rock vein. Same lovers mood we found in Fido Guido song, prevously released as a digital 45 last february, representing for Italy in this selection along with rising artists Attila and Maddawg, Greezzly long time collaborator Mc Baco and Mr. T.O outta Rootical Foundation band in combination with Neekoshy. Before the instrumental version ending the album aforementioned Greezzly home artist High Priest raise his rasta chant wich is also the starter of his well received album "Move On. Un mese dopo l'uscita dell' album di High Priest, La Greezzly production è di nuovo fuori con 13 tracce su un riddim dalle sonorita' prettamente rub a dub. Roots & Kulcha è il titolo del lavoro che vede una line-up di artisti di livello da tutto il mondo. La selezione si apre con la titol track dell' artista giamaicano Asante Amen; prosegue con Ras Penco, artista conosciuto per le sue it internazionali come "Thousand Miles Away", che condivide la sua gioia per l'arrivo del suo primo figlio. La super star reggae Skarra Mucci interpreta il riddim con una profonda tune conscious. Cosi' come l'artista Teacha Dee, che attualmente lavora sull' atteso album da solista. Diverse tematiche per l'artista Don Tippa che lancia un vero inno al rub dub style e per Mr Ice che intraprende una vena più lover. Stessa vena seguita dall'artista Fido Guido, la cui tune era già stata rilascita come un digital 45 lo scorso febbraio. A rappresentare l'italia in questa ricca selezione abbiamo altri artisti come Attila e Maddawg, Mc Baco, Mr T.O outta Rootical Foundation in combinazione con Neekoshy. A concludere abbiamo l'artista di casa Greezly High Priest che nella tune tratta tematiche rasta; artista che abbiamo già visto collaborare con l'etichetta nel suo ultimo lavoro Move On, che ha già ricevuto ottimi riscontri.